Graceful lines and gorgeous details give the Giselle Collection an aesthetic you will not find in your average bathroom vanity. With matte gold hardware, a gleaming integrated carrera white marble top, and a stunning natural walnut finish, the Giselle 33 inch vanity combo commands attention without being ostentatious. An open shelf and roomy soft-close drawers deliver ample storage. Giselle transforms a blah bathroom into a luxurious spa. Pair it with the matching mirror to complete the look. 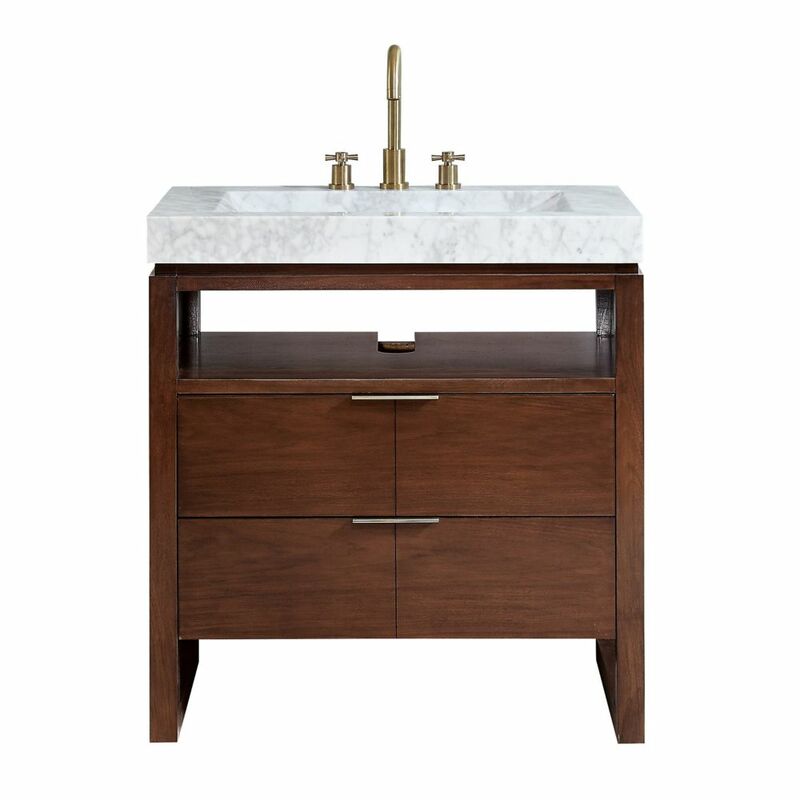 Giselle 33 inch Vanity in Natural Walnut with Integrated Carrera White Marble Top Graceful lines and gorgeous details give the Giselle Collection an aesthetic you will not find in your average bathroom vanity. With matte gold hardware, a gleaming integrated carrera white marble top, and a stunning natural walnut finish, the Giselle 33 inch vanity combo commands attention without being ostentatious. An open shelf and roomy soft-close drawers deliver ample storage. Giselle transforms a blah bathroom into a luxurious spa. Pair it with the matching mirror to complete the look.